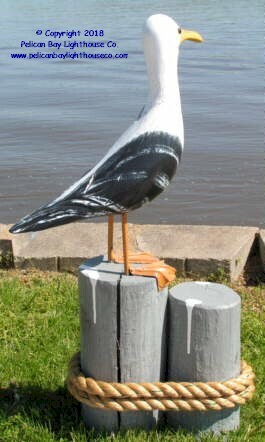 Large seagull on pilings. Carved wood, with steel legs for durability. Approx. 35" tall including pilings, weighs approx. 23 lbs. This item is also available with sunglasses at no charge. Just let us know when checking out. This item ships via UPS Ground only. V.J. Phillips crates each item by hand to be sure your item arrives safely.